With the JInternalFrame class you can display a JFrame-like window within another window. Usually, you add internal frames to a desktop pane. The desktop pane, in turn, might be used as the content pane of a JFrame. The desktop pane is an instance of JDesktopPane, which is a subclass of JLayeredPane that has added API for managing multiple overlapping internal frames. You should consider carefully whether to base your program's GUI around frames or internal frames. Switching from internal frames to frames or vice versa is not necessarily a simple task. By experimenting with both frames and internal frames, you can get an idea of the tradeoffs involved in choosing one over the other. Click the Launch button to run InternalFrameDemo using Java™ Web Start (download JDK 7 or later). Alternatively, to compile and run the example yourself, consult the example index. 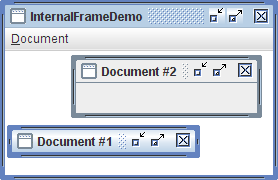 Create new internal frames using the Create item in the Document menu. Each internal frame comes up 30 pixels lower and to the right of the place where the previous internal frame first appeared. This functionality is implemented in the MyInternalFrame class, which is the custom subclass of JInternalFrame. The following code, taken from InternalFrameDemo.java, creates the desktop and internal frames in the previous example. //Make dragging a little faster but perhaps uglier. The code for using internal frames is similar in many ways to the code for using regular Swing frames. Because internal frames have root panes, setting up the GUI for a JInternalFrame is very similar to setting up the GUI for a JFrame. JInternalFrame also provides other API, such as pack, that makes it similar to JFrame. Just as for a regular frame, you must invoke setVisible(true) or show() on an internal frame to display it. The internal frame does not appear until you explicitly make it visible. Internal frames are not windows or top-level containers, however, which makes them different from frames. For example, you must add an internal frame to a container (usually a JDesktopPane); an internal frame cannot be the root of a containment hierarchy. Also, internal frames do not generate window events. Instead, the user actions that would cause a frame to fire window events cause an internal frame to fire internal frame events. Because internal frames are implemented with platform-independent code, they add some features that frames cannot give you. One such feature is that internal frames give you more control over their state and capabilities than frames do. You can programatically iconify or maximize an internal frame. You can also specify what icon goes in the internal frame's title bar. You can even specify whether the internal frame has the window decorations to support resizing, iconifying, closing, and maximizing. Another feature is that internal frames are designed to work within desktop panes. The JInternalFrame API contains methods such as moveToFront that work only if the internal frame's container is a layered pane such as a JDesktopPane. If you have built any programs using JFrame and the other Swing components, then you already know a lot about how to use internal frames. The following list summarizes the rules for using internal frames. For additional information, see How to Make Frames and The JComponent Class. You must set the size of the internal frame. If you do not set the size of the internal frame, it will have zero size and thus never be visible. You can set the size using one of the following methods: setSize, pack, or setBounds. As a rule, you should set the location of the internal frame. If you do not set the location of the internal frame, it will come up at 0,0 (the upper left of its container). You can use the setLocation or setBounds method to specify the upper left point of the internal frame, relative to its container. To add components to an internal frame, you add them to the internal frame's content pane. This is exactly like the JFrame situation. See Adding Components to the Content Pane for details. Dialogs that are internal frames should be implemented using JOptionPane or JInternalFrame, not JDialog. To create a simple dialog, you can use the JOptionPane showInternalXxxDialog methods, as described in How to Make Dialogs. You must add an internal frame to a container. If you do not add the internal frame to a container (usually a JDesktopPane), the internal frame will not appear. You need to call show or setVisible on internal frames. Internal frames are invisible by default. You must invoke setVisible(true) or show() to make them visible. Internal frames fire internal frame events, not window events. Handling internal frame events is almost identical to handling window events. See How to Write an Internal Frame Listener for more information. When a desktop has many internal frames, the user might notice that moving them seems slow. Outline dragging is one way to avoid this problem. With outline dragging, only the outline of the internal frame is painted at the current mouse position while the internal frame's being dragged. The internal frame's innards are not repainted at a new position until dragging stops. The default behavior (called live dragging) is to reposition and repaint some or all of internal frame continuously while it is being moved; this can be slow if the desktop has many internal frames. The following tables list the commonly used JInternalFrame constructors and methods, as well as a few methods that JDesktopPane provides. Besides the API listed in this section, JInternalFrame inherits useful API from its superclasses, JComponent, Component, and Container. See The JComponent Class for lists of methods from those classes. Like JInternalFrame, JDesktopPane descends from JComponent, and thus provides the methods described in The JComponent Class. Because JDesktopPane extends JLayeredPane, it also supports the methods described in The Layered Pane API. JInternalFrame(String, boolean, boolean, boolean, boolean) Create a JInternalFrame instance. The first argument specifies the title (if any) to be displayed by the internal frame. The rest of the arguments specify whether the internal frame should contain decorations allowing the user to resize, close, maximize, and iconify the internal frame (specified in that order). The default value for each boolean argument is false, which means that the operation is not allowed. static int showInternalOptionDialog(Component, Object, String, int, int, Icon, Object, Object) Create a JInternalFrame that simulates a dialog. See How to Make Dialogs for details. Container getContentPane() Set or get the internal frame's content pane, which generally contains all of the internal frame's GUI, with the exception of the menu bar and window decorations. JMenuBar getJMenuBar() Set or get the internal frame's menu bar. JLayeredPane getLayeredPane() Set or get the internal frame's layered pane. void setVisible(boolean) Make the internal frame visible (if true) or invisible (if false). You should invoke setVisible(true) on each JInternalFrame before adding it to its container. (Inherited from Component). void pack() Size the internal frame so that its components are at their preferred sizes. void setLocation(int, int) Set the position of the internal frame. (Inherited from Component). void setBounds(int, int, int, int) Explicitly set the size and location of the internal frame. (Inherited from Component). void setSize(int, int) Explicitly set the size of the internal frame. (Inherited from Component). int getDefaultCloseOperation() Set or get what the internal frame does when the user attempts to "close" the internal frame. The default value is DISPOSE_ON_CLOSE. Other possible values are DO_NOTHING_ON_CLOSE and HIDE_ON_CLOSE See Responding to Window-Closing Events for details. void removeInternalFrameListener(InternalFrameListener) Add or remove an internal frame listener (JInternalFrame's equivalent of a window listener). See How to Write an Internal Frame Listener for more information. void moveToBack() If the internal frame's parent is a layered pane such as a desktop pane, moves the internal frame to the front or back (respectively) of its layer. boolean isClosed() Set or get whether the internal frame is currently closed. The argument to setClosed must be true. When reopening a closed internal frame, you make it visible and add it to a container (usually the desktop pane you originally added it to). boolean isIcon() Iconify or deiconify the internal frame, or determine whether it is currently iconified. boolean isMaximum() Maximize or restore the internal frame, or determine whether it is maximized. boolean isSelected() Set or get whether the internal frame is the currently "selected" (activated) internal frame. Icon getFrameIcon() Set or get the icon displayed in the title bar of the internal frame (usually in the top-left corner). boolean isClosable() Set or get whether the user can close the internal frame. boolean isIconifiable() Set or get whether the internal frame can be iconified. boolean isMaximizable() Set or get whether the user can maximize this internal frame. boolean isResizable() Set or get whether the internal frame can be resized. String getTitle() Set or get the window title. JDesktopPane() Creates a new instance of JDesktopPane. JInternalFrame getAllFrames() Returns all JInternalFrame objects that the desktop contains. JInternalFrame getAllFramesInLayer(int) Returns all JInternalFrame objects that the desktop contains that are in the specified layer. See How to Use Layered Panes for information about layers. int getDragMode() Set or get the drag mode used for internal frames in this desktop. The integer can be either JDesktopPane.LIVE_DRAG_MODE or JDesktopPane.OUTLINE_DRAG_MODE. The default for the Java look and feel is live-drag mode. The following examples use internal frames. Because internal frames are similar to regular frames, you should also look at Examples that Use Frames. MyInternalFrame This page. Implements an internal frame that appears at an offset to the previously created internal frame. InternalFrameDemo This page. Lets you create internal frames (instances of MyInternalFrame) that go into the application's JDesktopPane. InternalFrameEventDemo How to Write an Internal Frame Listener Demonstrates listening for internal frame events. Also demonstrates positioning internal frames within a desktop pane.